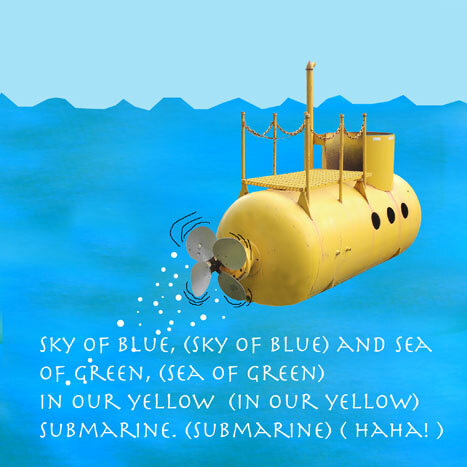 We do all live in a yellow submarine! Adventure. Fantasy. Wonderment. Sense of Discovery. Camaraderie. Tolerance. Ingredients, all inclusive, when the Beatles ran up the flag on the song “Yellow Submarine.” As a statement, a philosophy, it spoke to our sense of playfulness. It was written purposefully as a child’s song, a memorable human ditty. “Yellow Submarine” symbolizes disparate ideals. Adventure seems to be at the forefront: Peter Pan, Swiss Family Robinson, The Castaway, Edward Abbey, John Muir, Eliot Porter, Ansel Adams; multitudes of life stories represent human journeys imagined or real. So many things yet to be discovered. We all yearn for excitement in our lives and easily understand that, in effect, each of us can live, symbolically, in a yellow submarine. The secret is to seek out and embrace our dreams, large or small, and live them. 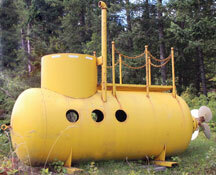 The yellow submarine on the side of the road in British Columbia. The magical hand of the craftsman cleverly captured the spirit of the “Yellow Submarine,” his research and welding skill bringing magic to his creation. From the periscope to the perforated steps to the propeller, it had a sense of authenticity. The little vessel, complete with port holes, sat proudly on his lawn announcing to every passerby that this was a house with keen imagination, a zest for adventure, abounding in playfulness. The whole image of this friendly vessel, sitting aside the road, brought immediately to mind the people we have met along the way who commented on our journey: “Oh, I have always wanted to do that,” or, “That is my dream, to travel and see America first hand.” It is really nice to be living everyone’s dream, especially since it has been my own life-long dream. My life philosophy excludes acrimonious intolerance and thrives on imagination and curiosity. The “Yellow Submarine” for me reeks with excitement, joy of possibilities, make-believe or real. I find my friends on the premise that everyone is my friend until they prove otherwise. I find great joy in sharing my life journey with anyone who is interested enough to listen and to feel the magic of it. 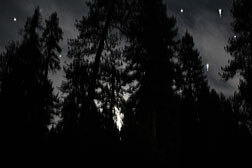 The aforementioned forest experience occurred one night (quite out of the blue you might say) at Jerseydale Campground Sierra National Forest near Yosemite National Park in California. The night sky presented us with a “Yellow Submarine” evening by full moon. The starry, starry night sky was wonderfully agleam with an unimaginable amount of stars, including the Milky Way. Soon the moon rose, sending shafts of light through the stand of redwoods, ponderosa pine, and hemlocks nearby our campsite, coloring them softly with silver highlights. The sky was indigo blue with bright stars shining through despite an even brighter moon. And old Mr. Moon smiled down upon us, as he always does when full, his presence seeming to bend the trees as they reached high in the sky to meet him. This evening magic began at sunset, October 7th, 2011. The forest came alive with orange rim light as dusty, golden shafts of sunlight lent a cathedral appearance around us. We were alone there. Not another soul in the campground. I lit a warm fire of split, dry cedar logs some kind, previous camper left for us at our campsite. The orange flame and gray smoke warmed our spirits and set our hearts aglow with joy for life in the forest. We listened to the “baying-moos” song of the cow herds close by as they returned to the feeding area from the high mountain fields. Choruses of crickets, frogs, and night birds filled the twilight air. A sort of enchantment came with the evening dew as it lightly coated trees and flora. Highlights of orange-yellow sunset light danced about as cooling night air came on the gentle breezes.